Our vist to the Legong Dance Performance at the Pura Dalem in Ubud was fantastic! Even the setting was impressive. It was held outdoors at a temple (pura). 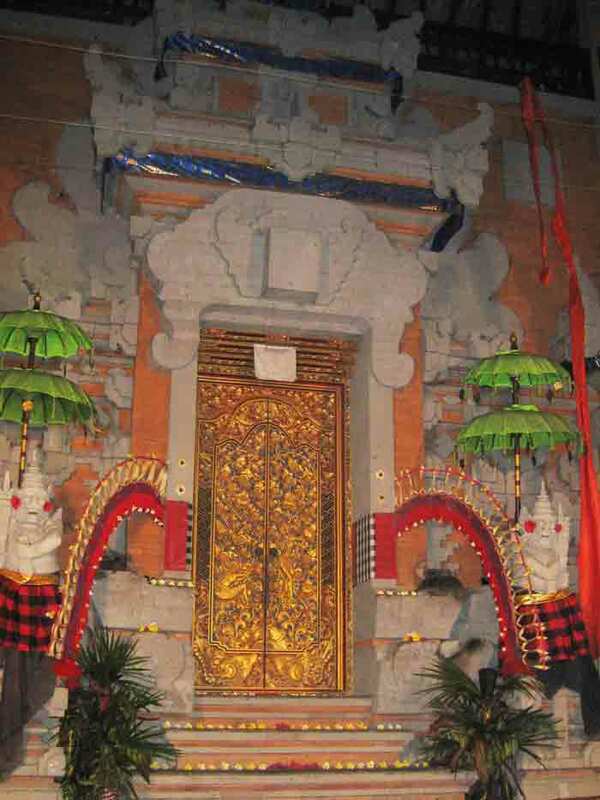 As everywhere else in Bali it was elaborately decorated with infinite care taken in all details- even to the placement of flowers along the edge of each step. The music was provided by a gamelan orchestra. The gamelan instruments are unique to Indonesia and are percussion instruments, except for hollow reed flutes. The musicians work in pairs. The xylophone type instruments are struck with a mallet and immediately damped with the other hand to prevent a muddy sound. The instruments are handmade and beautifully finished. The instruments work, basically, on a pentatonic (5-note) scale and somehow mange to blend wonderfully. All music and dance is dedicated to glorifying the gods and are intregal to worship. There have been minor modifications over the year for tourism, but, in fact, the performances are really religious in nature. We watched six different dances, each very different from the others. The opening dance was called Panyembrahma. It is a dance of welcome and ends with the dancers showering the guests with flower petals. Panyembrahma dance. Balinese dancing involves a great deal of dramatic _expression_ through the hand and body movements, and, especially, through the eyes. 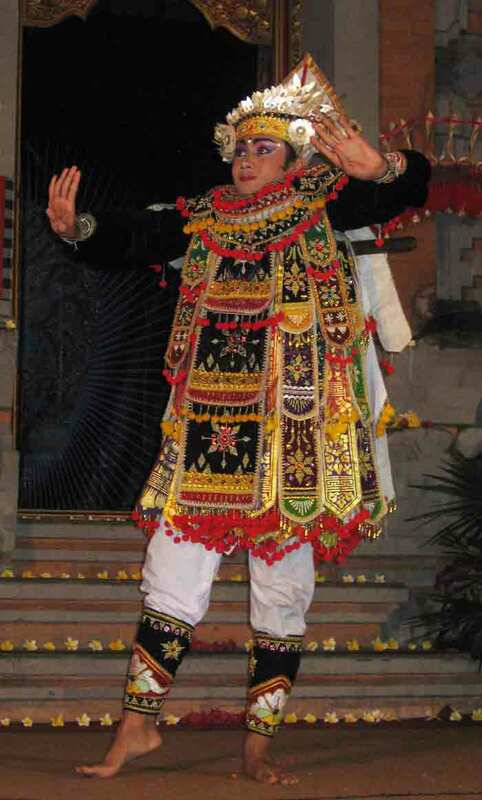 The Kebyar Terompong dance highlights a talented dancer who also plays a row of pot gongs very skillfully. In the Baris dance, a warrior depicts the courage and virtues of an admirable hero who is going to war. The Legong Dance, the highlight of the evening was performed by three girls telling the story of King lasem in which the king desires the unwilling daughter of his enemy, whom he is planning to slay. The king himself is subsequently slain in battle. The Oleg Tambulilingan dance is one with two dancers depicting a girl and boy bumblebee. It is charming.